Crispy on the outside and soft on the inside, these hash browns are quick and easy to make and taste amazing. Add a dollop of sour cream, a crumbled strip of turkey bacon, a sprinkle of cheese, and a pinch of scallions, and it’s like a baked potato but even better. I love hash browns. If I’m at McDonald’s early enough, I buy myself not one, but two, because they’re that good. Not that I’m advocating eating breakfast at McDonald’s. Because I’m not. The food there is so terrible for you. But I have to admit, their hash browns are amazing. Guilty pleasure. I wanted to make hash browns at home so I could have them whenever I want. I went out and bought a box of Ore-Ida’s hash browns from Safeway, but when I fried them up, the potatoes lacked color and were not crunchy at all. I was so disappointed. Then I decided that I wanted to try making them from scratch. I’m so glad I did. It’s quick and simple and it’s exactly what I was looking for. All you need are large Russet potatoes and a little bit of olive oil. One potato makes three servings. Isn’t that great? Optional ingredients are sour cream, turkey bacon, cheese, scallions, and salt and pepper. First, wash the potato. 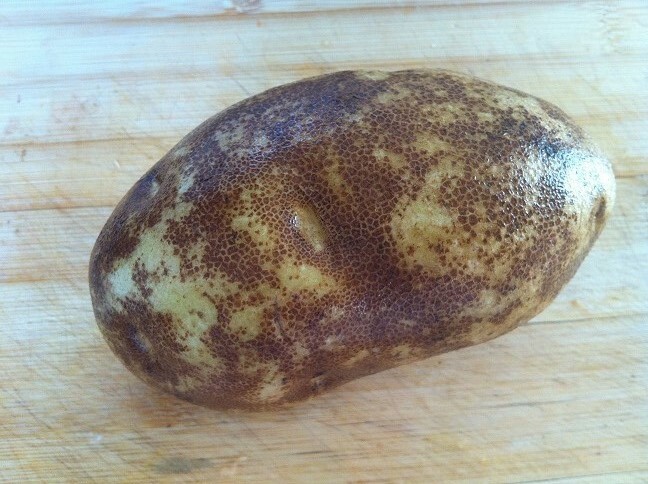 You’re going to peel the skins off, but potatoes are grown underground so it’s better just to wash them. 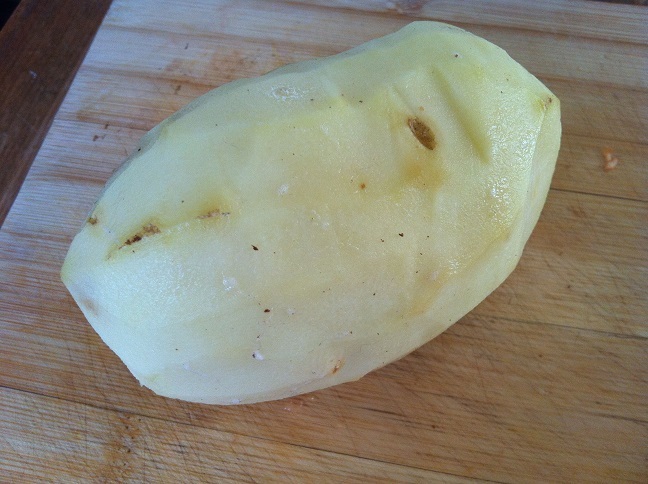 Peel off the skin of the potato using either a peeler or a knife. 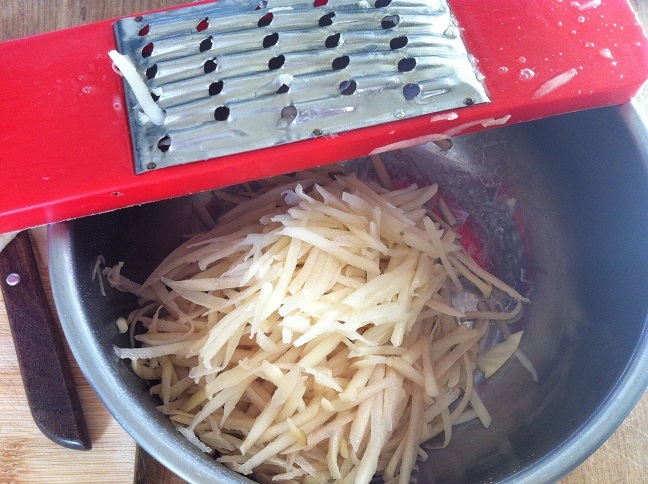 Using a mandoline or a knife, cut the potato into the size of matchsticks. If you’re using a mandoline, be careful where you place your fingers. The blades are very sharp. 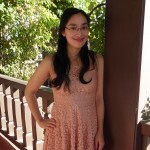 Heat about a tablespoon of olive oil in a skillet or use cooking spray. Add a handful of potatoes to the skillet. But be very careful. Potatoes contain a lot of water so it’s very likely that the oil will crackle and spray everywhere. 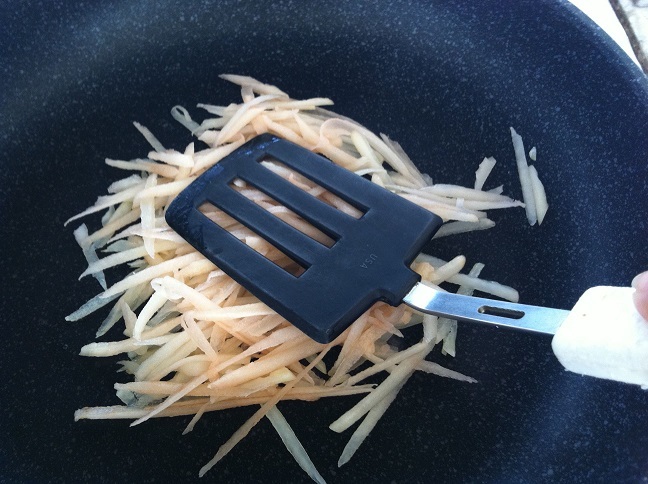 Using a spatula, flatten the shredded potatoes against the skillet so that it becomes a thin layer. 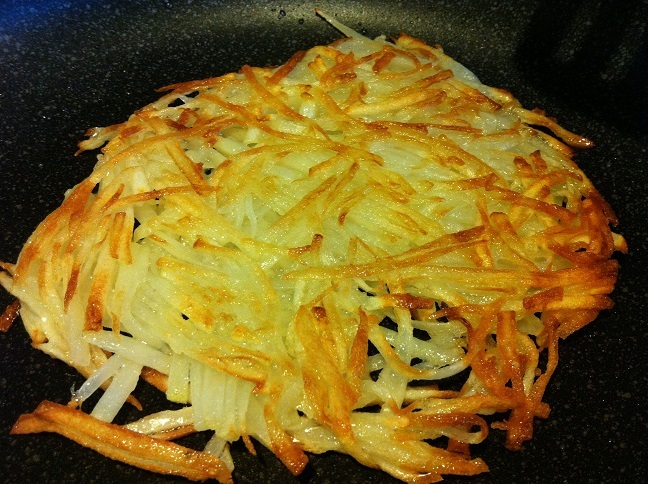 If you like your hash brown more circular, use the spatula to move the shredded potatoes in that general shape. 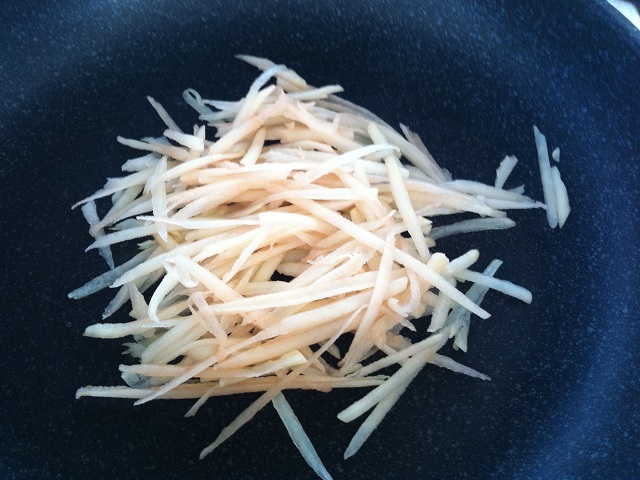 The shredded potatoes should form a diameter of about 5 inches, more or less. Once the side faced down turns golden brown and crispy, flip the hash brown to the other side. Cook until both sides are golden brown and crispy to your liking. If one side isn’t crispy enough, you can flip it over and fry until it is. 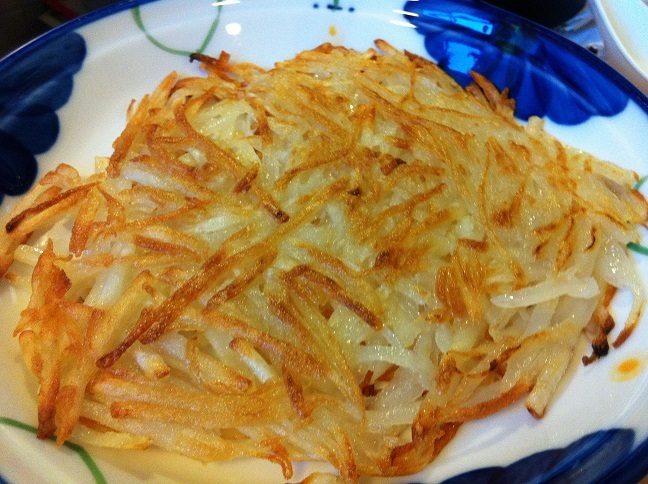 Place the finished hash brown on a plate and dab with a paper towel to drain the oil. Repeat with the rest of the shredded potatoes. Now, fry the bacon strips until crispy as indicated by the directions on the package. 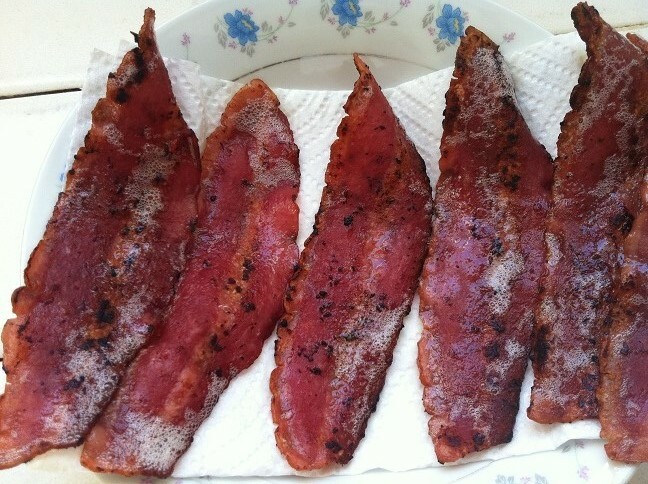 Place the bacon on a paper towel to drain. Place a dollop of sour cream on top of the hash browns. 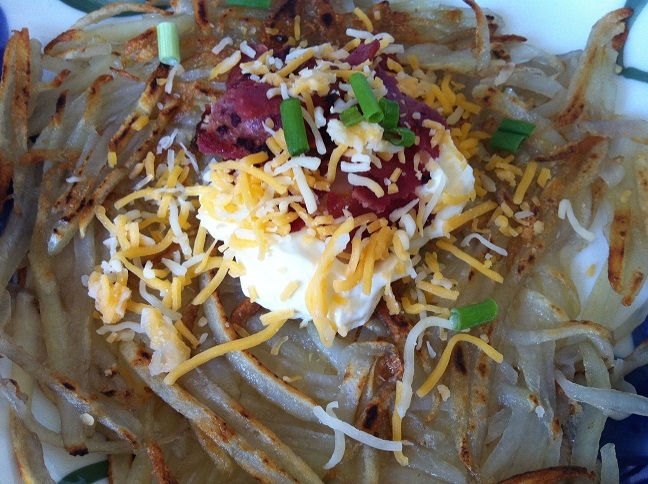 Tear or cut up the bacon strips and place about one bacon strip per hash brown over the sour cream. Sprinkle on the cheese and chopped scallions. Add salt and pepper on top, to taste. 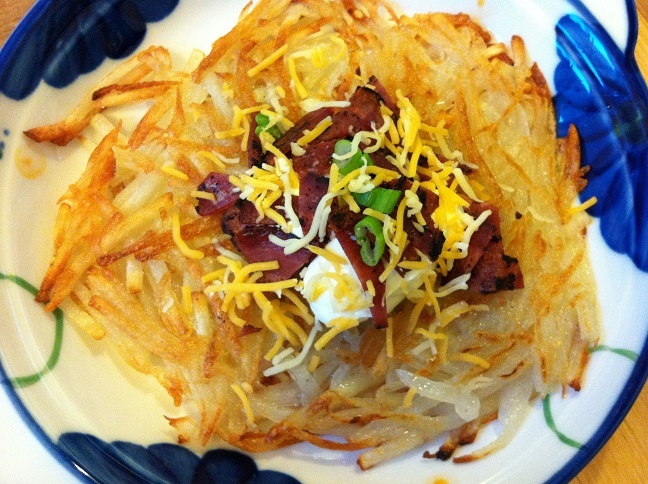 This entry was posted in Breakfast, Quick and Easy, Recipes, Sides and tagged bacon, breakfast, hash browns, loaded hash browns, loaded potatoes, quick and easy, side. 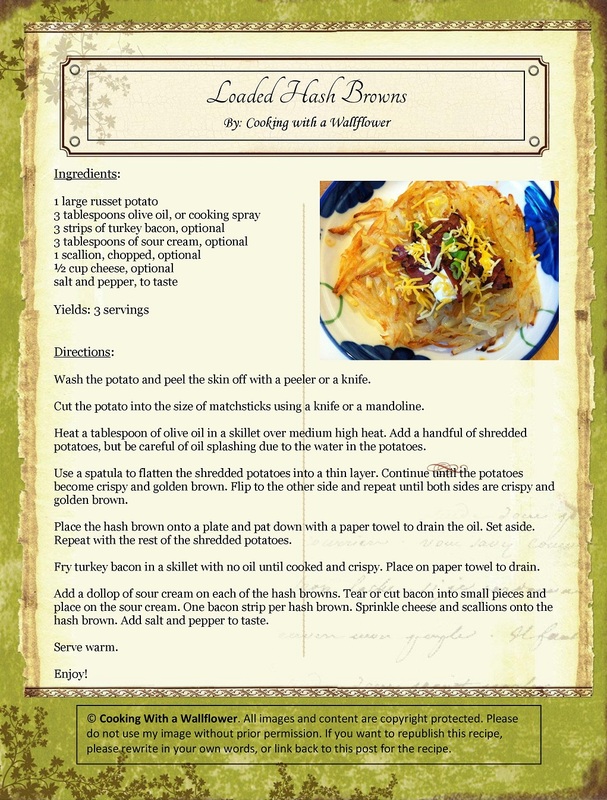 Looks good – it made me hungry just reading it! One I will try later.